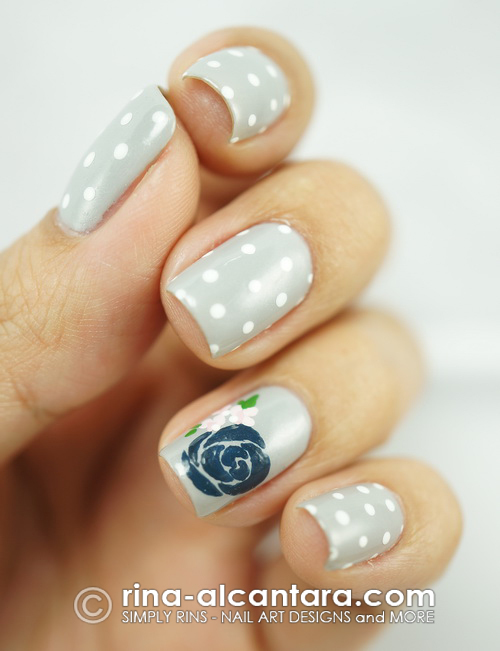 One of the good things I like about nail art is being able to match it with any outfit. I've done so a few times and what I am about to share is another. I attended an event last Friday that required us girls to wear a summer dress and I wanted my nails to match. First, let me show you the nail design. I didn't have a lot of time so I decided to wear 2 accent nails. Obviously, I do not know how to pose well. As you can see, it was quite easy to create a nail art that would match the dress. A simple polka dot design would have been enough. But I really wanted to do some accent nails so I decided on painting a blue rose on each hand with pink/light blue flowers. 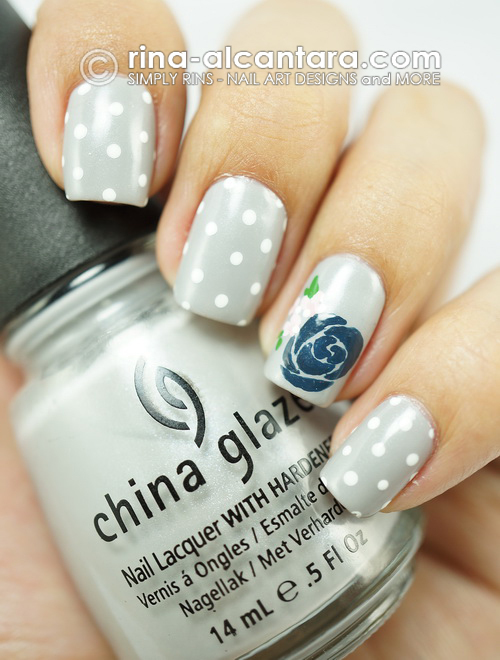 I used 2 coats of China Glaze Pelican Gray as base color. It has hints of shimmer and applies really well. And I hand painted the nail design using acrylic paints and a detailing nail art brush. This nail design will probably be one of those memorable ones because I wore it on a day I met up with an old college friend. Our conversation over coffee was ... entertaining. And it cleared some questions in my head. Sometimes, a blast from the past is a good way to find reasons regarding the present. Did I make any sense? Oh, this nail art will be memorable too because it took me almost 2 hours to get home. Manila traffic can be so unpredictable. To think that I head home at 11pm. As much as I love to drive, it's not fun to do so when the roads are congested. This is a perfect match - love it! I am 36yrs old and I still get comments that I look young. At most times, I take it as a compliment. I don't really know how to change the way I look. I tried growing my hair longer (I prefer it to be short) and started wearing dresses. My very small frame is not helpful either.